Robins can be attracted to a feeding station by offering mealworms, fruit and a birdbath. 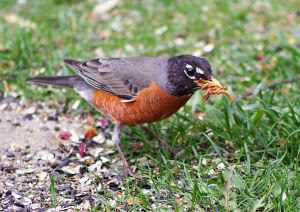 It’s especially fun to offer mealworms during nesting season when the robins can stop and pick up a mouthful of tasty worms to take back to their babies. They will fill their mouth until you think nothing else could possibly fit inside and still continue to try to pick up more, dropping some in the process and then trying to pick up more.